It’s hard to believe that August is well on its way this year. Yes, time flows like water so I guess we just need to jump in and enjoy the flow. Happy Monday to all. 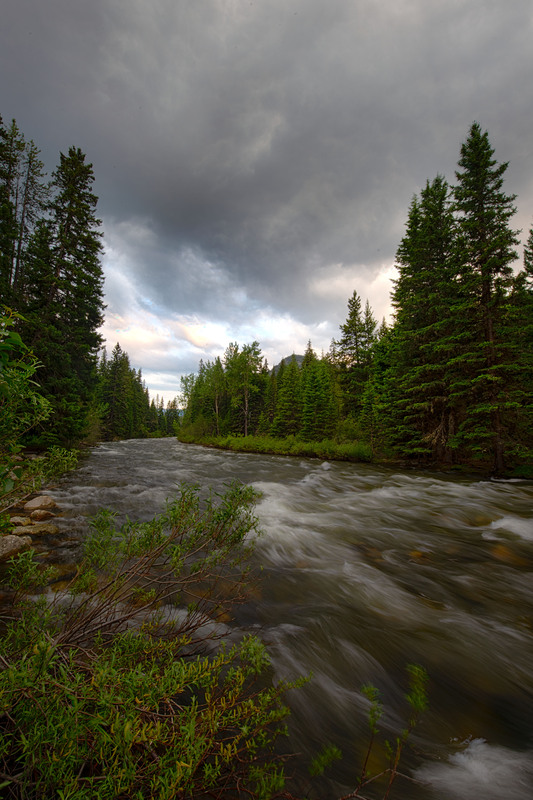 Water flowing along the Boulder river as a summer thunderstorm looms overhead. We woke to a thunderstorm this morning. It was a good thing. I like them. HI Jim, there is nothing like a good thunderstorm rumbling away to start the day. We had some nice rumbling the other evening along with about a 25 degree drop in temps over half an hour. Great photo! I love the long exposure that you used. HI Sam, the dark skies dictated a longish expose on that one. Lots of nice drama in this shot, Mike. The river looks nice and cool on this hot day. Hi Eliza, the rivers are one nice refreshing gift on a hot summer day. Although it has been a pleasant summer so far looks like we are going to get a bit of heat this week so back to the river we go. Like the effect of your exposure…good stuff…want to dive right in! Thanks, the dark skies dictated a longish expose. Moody photo Mike. The year is indeed speeding by. Hi Miriam, it was moody enough to drive us into the tent when that thunderstorm decided to pay us a visit. It was however short and followed by start skies that evening. The many and ever changing moods of the weather. Why does it seem that the sense of time speeds up with each passing year? Yes, nature can be so wild and unpredictable. So can the passing of time. The only prediction we can make of time is that it does always seem to flow forward. Indeed it does so we may as well move with it.